With so much information available these days it can be difficult to distinguish the root cause of a collision from things that may just be contributing factors or worse yet, simply unrelated matters of circumstance. The problem when it comes to winter tires generally stems from a lack of understanding of what makes them different from all-season tires and what those differences mean in terms of vehicle performance. The article explains the unique characteristics of winter tires, and why they are necessary for cold and snowy Canadian winters. They key: the ‘softness’ of your tire will allow it to adhere to the cold and icy road better than all-season ‘hard’ tires. The compounds in winter tires are generally softer at the same temperatures than those used in all-season tires and are formulated to better adhere to ice and snow. 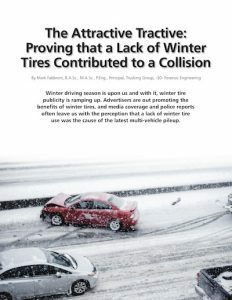 The article then explores the effect winter tires have on collisions. For instance, the variety of configurations in which winter tires are mounted on vehicles can have a significant effect.